The crew over at the Microsoft Office Blog has some tips on how to create notes and sync them to Windows Live Skydrive. I have personally used OneNote to take quick notes about beers and wines as I'm out and about. It's a great tool and a great substitute for those addicted to Evernote. Hit the link for some details on how to get up and running in no time. The option for Skydrive is very good for those who wish to use it, but being required to go through a cloud to get my data from cell phone to puter and viceversa is like being required to go through Microsoft to purchase a cell phone, and why would I wish to jump through that hoop rather than order a phone directly from the carrier? 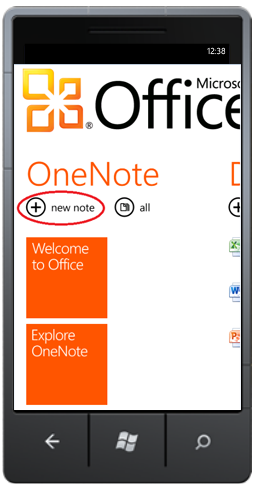 Yo, I have OneNote on my puters as well as on my HTC Fuze WinMob 6.5 phone---and they easily, quickly, directly sync with each other. Why would I want to cruise through SkyDrive? Actually, the article is pretty light on the 'how'.... it basically says "...open up a note, put in your ideas/thoughts, then sync it up to skydrive to have it available on your PC..." big help. Here, I THOUGHT it was going to provide some neat way to keep up with the prof without having to resort to an external keyboard.